Training Issues in Small Business Writing Assistance, Inc.
Small—and even some medium-size—business owners do not delegate significant responsibilities and use the majority of their time directing day-to-day activities. The owner or general manager spends all of his or her valuable time directing the business needs of production, scheduling, sales, shipping, accounting, and human resources. If there are any supervisors and managers, they are usually picked because of loyalty to the owner, have been there for a long time, or possess a vital skill. Key company roles are often filled by family members—not due to competency but because they are family members. There is a reason these unwieldy management practices are so common. In nearly every instance it is because the company is filled with poorly trained managers, supervisors, and workers. Two more sinister reasons go hand in hand: a complete lack of trust in the workforce, or the owner prefers the existing situation because it fills a control need. What passes for training is spending some time with the person being replaced or with someone that has previously worked the job. The OJT (on-the-job training) trainer is overworked and frustrated because training takes away from his or her job, so the training is often short and incomplete. Because he or she was trained the same way, the OJT trainer may not know everything the job entails. When the OJT teaches the new worker, the trainer may make mistakes and leave something out. There are several reasons for the lack of real training, with a major point being because it “costs too much.” A common refrain is, “We are too busy to take time off for expensive training.” Some small business owners believe no one can do the job as well as they can; nobody understands the business like they do. Others wonder why they should train people who will quit and go to work for a competitor. It is quickly evident these reasons for not training employees are short-sighted and detrimental to the business. Small business owners who truly want to grow their company instill a more professional attitude and workplace culture into their business must invest in training. For a training program to be successful in a small business the most important thing is to have a strong commitment from the owner and all supervisory and management personnel. Commitment from the top always means there will be time and resources for training. Once a commitment is in place, the next step is a needs assessment. Determine what skills and competencies are necessary and if they are in-house. For many companies, this is difficult because they are so close to the problems and do not see them clearly. In most instances, the needs assessment is best done by an outside agent who brings a fresh, unbiased approach. The needs assessment will determine whether the organization has all of the necessary skills to perform training—knowing how to do the job does not necessarily translate into knowing how to train others on the job. Companies usually are not equipped to perform all of the necessary training. This is particularly true with complex machinery, supervisory skills, and legal areas. Once the process begins, it should press forward in all three areas, at the same time if possible. First, review hiring practices. This step will almost always require an outside consultant. Define desired employee qualities and characteristics. No more hiring to find a warm body, but finding ideal employees based on the company’s needs for a particular position. The small business owner and hiring managers must receive training on how to legally identify job candidates that have the ability to do the job and fit in the company culture. Normally, this will not require much time—detailed training for HR and interview training for the owner or manager. The second area of the process is training and re-training for current employees and new hires. Create a written training plan for the particular job/task. This step will require a major commitment as it will require a significant time investment. Time spent on this step is worth it because dividends will appear in several areas—quality, a general increase in efficiency, higher production, reduced overhead, and increased profits. Implement a periodic progress review of current job performance at least quarterly. Part of the review should cover the potential for promotion or moving to a job with increased responsibilities, as well as the possibility for a supervisory position. Have an annual review of company standards and policies as well as any mandated compliance training. This is not as time consuming as it sounds. Take a few notes on each employee on a regular basis with a 15-20 minute meeting every three months. Most employees will look forward to the review and better performance is almost always the result. New employee training is essential. A well organized plan for new hires goes a long way toward creating a good first impression and establishing the idea the company is a good place to work. Start with a plant tour. Assign each new hire a buddy in the same department. Carefully explain and obtain a sign off on company standards and policies with a strong emphasis on safety. Ensure the new hire has proper training. It can be formal or OJT, but it must be quality training. Supervisors must make frequent reviews of the new hire’s progress. It should be frequent enough the new hire will realize that management cares about how well they are doing. The review can be informal and must be non-threatening. The supervisor should refresh the new hire on company standards and polices during the review. New hire training should include a standards check for achievement at the end of the first three months. Always implement any corrective action on performance when necessary. Informal reviews take very little time and can fit easily into a supervisor’s daily routine. The third step is to provide supervisory skill training for all managers and supervisors, including the owner. This is absolutely essential to truly making a change in the business environment. Success in the hiring process and employee training hinges on better-trained and informed supervisors. Most supervisors have no idea of the correct way to lead workers. When faced with the pressure of production schedules, they often resort to any tactic that will fill orders on time. They get results, but many times quality suffers. Such tactics often drive good employees away. 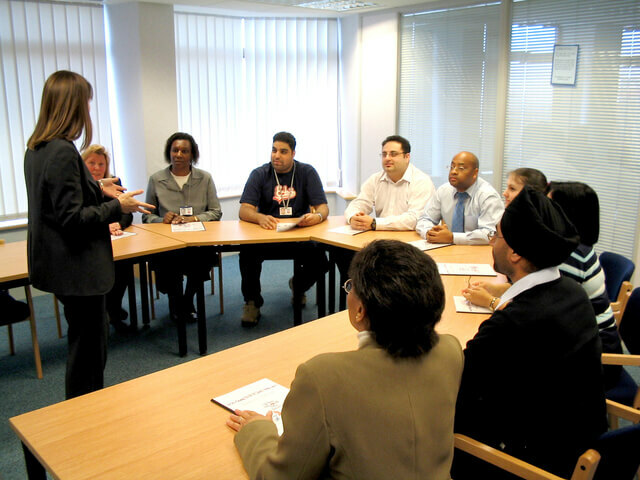 Usually the business does not have the resources internally to handle supervisory training. At this point, the small business owner has a decision that will determine the future of the organization: invest in supervisory training or stick with the old methods that are not working. Employees will have a mindset that promotes higher standards with better quality work. Workers will be better able to make decisions on their own without having to constantly stop production and interrupt management with routine questions. Profitability will improve because workers will know their jobs better. Savvy small business owners will move forward and make the investment. The benefits will definitely make a positive impact on employee morale, retention, and the bottom line. The result is the owner and management will spend less time solving the crisis of the day and more time on strategic issues, growing the company, and improving market position. Training receives lip service in most organizations, and few take it seriously. It is not a cost but an investment. It does take time and funds, but when a good training program is in place there is always a financial return that is greater than an increase in sales. Wise small business owners who commit to a sound training program will discover that finding time for training is easy. When they see the success that results from formally trained employees, fitting training into the workplace schedule becomes a priority. Time spent training has lasting value because it provides a solid foundation for sustaining a successful organization.